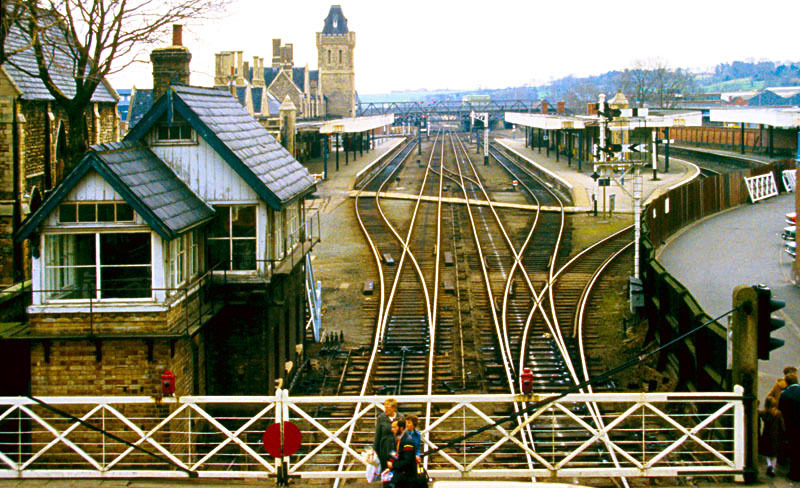 In 1983, before BR had built the deviation line and closed St Marks station, I visited Lincoln and took some signalling photos. Because this trip included an organised visit to five of the signal boxes, I was able to take photos of the interiors and equipment inside these boxes, as well as of outdoor signalling. Shortly before Network Rail replaced the remaining mechanical boxes here in Summer 2008, I made a return visit and took many more photos. It had always been my intention to return at some point, because I had been constrained by train times on my first visit and therefore hadn't been able to visit many of the easily accessible vantage points. West Holmes - at the western end of the goods lines and the junction for the chord to Boultham Jct. I also took a photo of nearby Sincil Bank, which is included further down this page. As the track geography here has changed since 1983, I have also included a simple sketch map of the area which shows what existed then, how it relates to today's layout, and where the signalboxes and other locations described on these pages are/were. Because these pages include photos of the equipment inside signalboxes, I have tried to include simple explanations of what things do and how they're used. 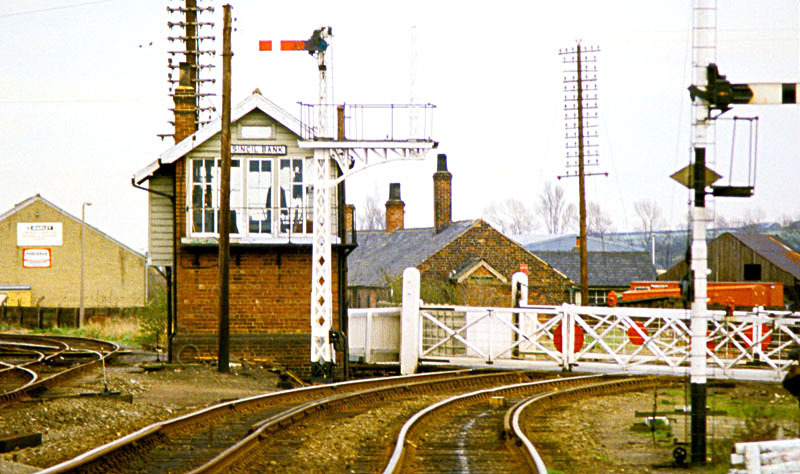 These are aimed at enthusiasts who have a basic knowledge of railways but may not have looked beyond the existence and basic operation of signals and signalboxes. 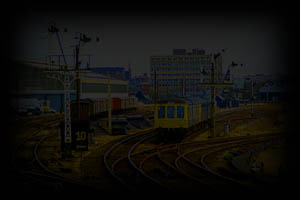 I don't have time or space to include a detailed introduction to signalling principles, which any case are well covered on the Home Signal Page website - I have included links to specific pages there where relevant for anyone looking for more detailed explanations. But if you are relatively unfamiliar with signalling principles, I recommend that as a first time visitor you browse these pages in the order I've listed them above, because the commentaries on the later pages may assume knowledge of things I've explained on earlier ones. Boultham Junction was originally a junction on the Lincoln avoiding line between Greetwell and Pyewipe Jcts, where a curve to West Holmes diverged. When St Marks station was closed, the avoiding line between here at Greetwell Jct was also closed. The trackbed here was then lowered a few feet and a deviation built to join up with the line from Newark. The curve to West Holmes, which had previously been a lightly-used freight branch, then became the main line into Lincoln for Nottingham/Newark trains. 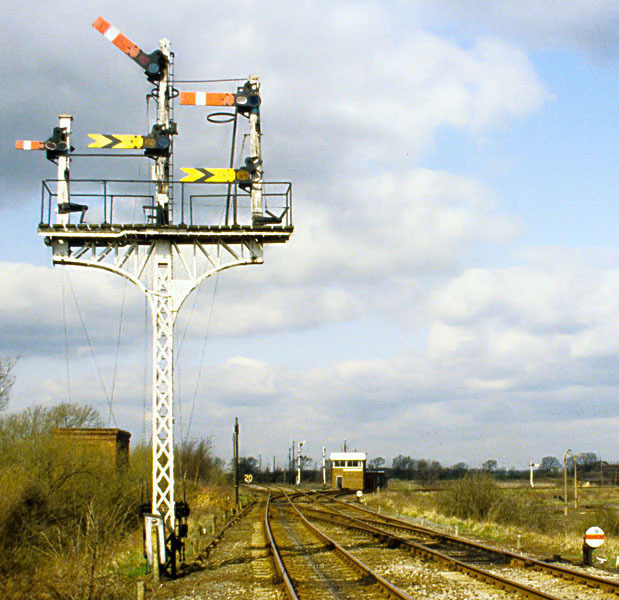 A single line to Pyewipe Jct was retained, mainly for diversionary purposes, with the whole triangle controlled from West Holmes until the 2008 resignalling. High Street controlled the level crossing and the western end of Central (now, just plain Lincoln) station. The motorised gates have since been replaced with barriers. Pelham St Junction controlled the junction at the eastern end of Central station. 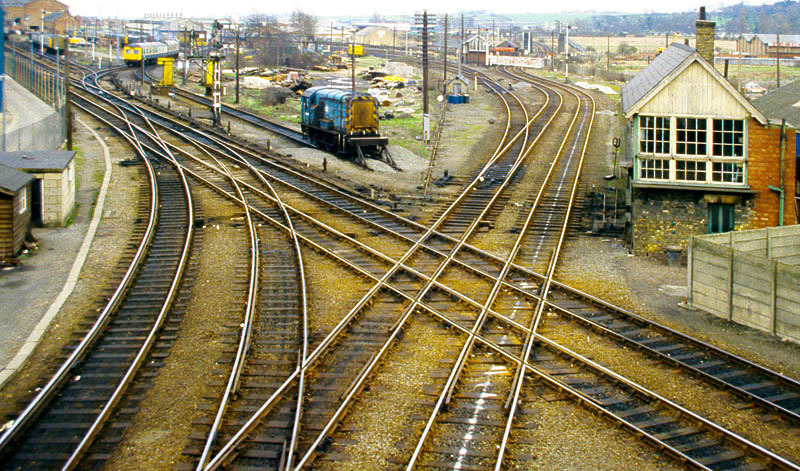 In 1983 it was also responsible for the line from Newark and St Marks station (lower right), which crossed the Sleaford line on the flat and joined into the Wrawby Jct line at Durham Ox Junction (left of the shunter loco). The sidings to immediately left of the Sleaford line were also the stub of the former line to Bardney. St Marks Station signalbox was at the south-western end of the former station. A DMU to Doncaster approaches West Holmes. As well as the junction for the line from Boultham Junction, it controlled a number of goods lines of which only the two parallel tracks to East Holmes now remain. 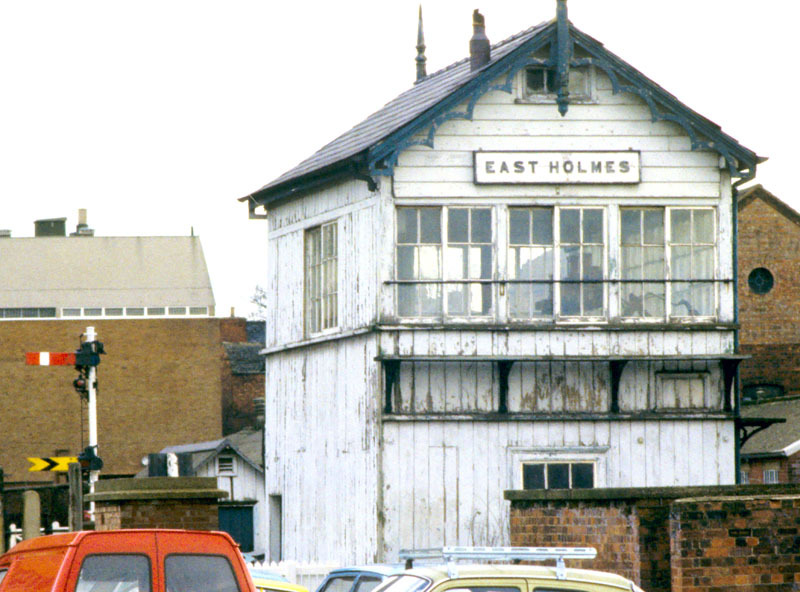 The original box visit didn't include East Holmes, but we walked nearby it and here is a photo of the signalbox and its up starter, with High Street's distant beneath. Following my 2008 visit, I have been able to add a page for this signalbox too. 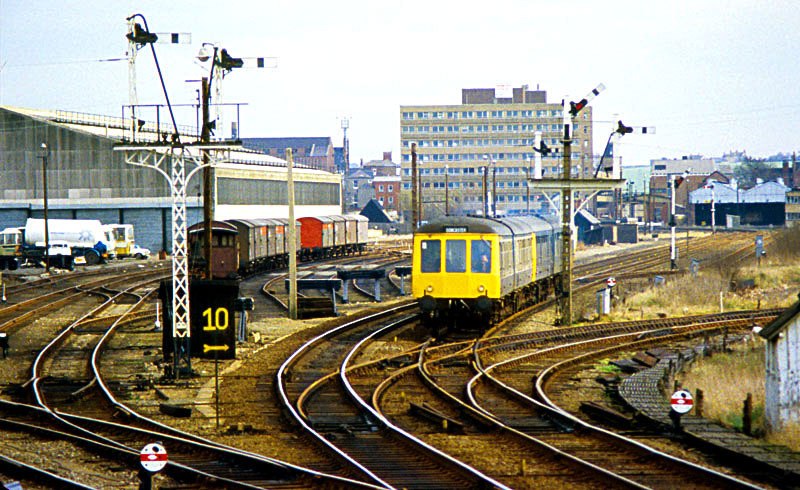 Another adjacent signalbox was Sincil Bank, a mere furlong from Pelham St Jct. In addition to the level crossing, this also used to be the junction for the ex-GNR line to Grantham. The up home signal visible here used to have a second arm on the right-hand doll to signal trains onto that line. My thanks to the East Midlands Trains station staff here for letting me pass through the station ticket barriers on my 2008 visit to take some of the photos I have used on these pages.